The University of Michigan has established a commission on achieving carbon neutrality, to help fight climate change. But student activists say the process is already deeply flawed. Carbon neutrality means reducing carbon emissions as much as possible, and balancing what's left with actions like planting forests, which absorb carbon, or buying credits with renewable energy companies. Jonathan Morris is a doctoral student in U of M's School for Environment and Sustainability. He says he's glad the University is at least looking at how to get to carbon neutrality - but it makes little sense for the university to expand its natural gas power plant at the same time. "Deciding today to expand our fossil fuel infrastructure locks us into decades of continued use and consumption of fossil fuels," says Morris. Morris also says the University is moving very slowly compared to some other universities. Ohio State University, for example, is getting about 25% of its electricity from wind farms. 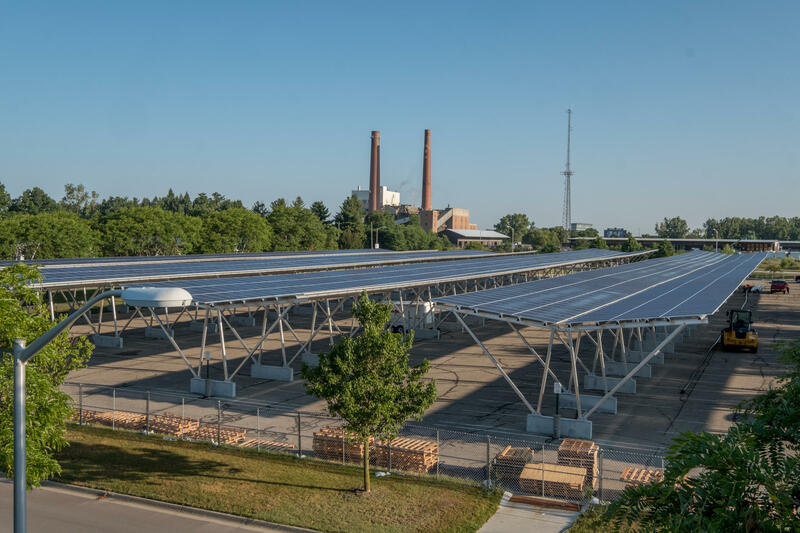 Michigan State University is installing solar panels on many of its carports on campus. Other universities have already committed to be carbon neutral by a certain date, he says. The University defends the decision to invest in its natural gas power plant, saying it will be much more efficient than the old one, and is necessary because of the need for reliable power for the hospital and research units. Correction: The original version of this story said the University was building a new natural gas power plant, as opposed to expanding its current plant. A new study says the U.S. Environmental Protection Agency should consider the effects of burning fossil fuels on children in its regulation process - and not just adults, as it mainly does now. The study conducted a systematic review of scientific literature on the effects on children's development and health from pollutants from fossil fuels. Those pollutants include particulate matter, powerful toxins known as polycyclic aromatic hydrocarbons, and nitrogen dioxide, as well as carbon dioxide, which is warming the planet.